Travelers are different from tourists. Real travelers avoid tourist places, because they want to feel the local spirit – mix with the local people, eat the local food, have fun at the places where locals go etc. If you want to do that in Bulgaria here is a list of things that will make your stay in Bulgaria easier and more pleasant. 2. When catching a taxi, always look at the sticker on the front and side wind screens. It shows the price per kilometre. 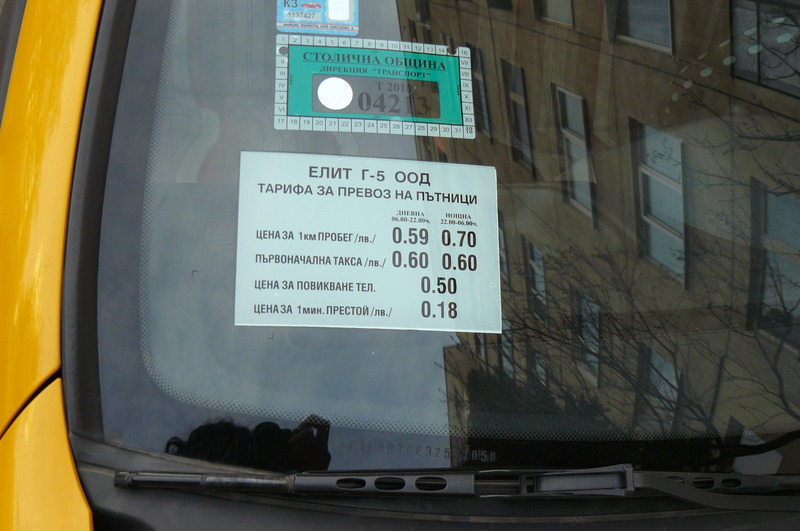 The normal rate is between 0.60 and 0.80 leva per kilometre. (Taxis are allowed, by law, to have as high prices as they want, as long as they announce them on their wind screens. Ridiculous, I know!). Here are some reliable taxi companies in Sofia: OK Supertrans Taxi (tel. 973 2121), €1 Taxi, (tel. 962-22-26), Yellow Taxi (tel. 91119) and Radio CV Taxi (tel. 91263). But still there are scammers who make their taxis look exactly as the OK cars so check the price on the stickers before you get in. This is what the sticker looks like. 3. Getting from Sofia Airport to the Central Bus and Railway Stations: You need to change vehicles once. Get on bus 84 from Terminal 1; and bus 284 from Terminal 2. Get off at Pliska hotel – a tall blue glass building. From Pliska hotel you can get on buses 213, 214, 305, 313 which will take you to the stations. You can also get on trolley 5, but it is a bit slower. The journey from Sofia Airport to the Central Bus and Railway Stations takes between 60 and 90 minutes. 4. Public Transportation – public transportation in Sofia is usually crowded. The vehicles are often old and worn out. The ticket for the public transportation in Sofia is 1 lev, no matter how far you travel or what type of transportation you are using. You can buy a ticket from the kiosks at the bus stops, from most newspapers kiosks, from a machine in the tram (on the back of the driver’s cabin) or directly from the driver. You can also by a set of 10 tickets which costs 7.5 leva (you save 2.5 leva:) Avoid riding the public transportation in Sofia during rush hour (8:30-9:30 am and 5:30-7:30 pm). Only the trams run relatively frequent during rush hour and the underground, but only part of it is ready and working. From Sofia there are buses and trains to almost any town in the country. Sofia Central Railway and Bus Stations are next to each other. You can buy a ticket from the registers at the stations. For most buses you can buy a ticket directly from the driver. 5. Watch your belongings – when you are at crowded places, or walking the streets of the bigger towns. This is a good advice for any crowded destination. We don’t want you to have bitter memories about Bulgaria. 2. Buy a vignette!!! 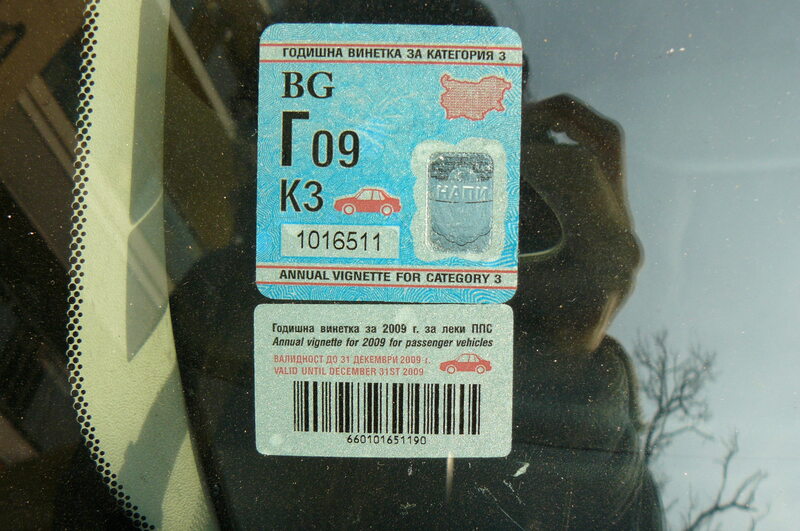 – This is a sticker that you stick on the front wind shield of the car (in the lower right corner) – by doing this you pay your road tax for Bulgaria. You can buy a vignette from the petrol stations. It is pronounced [vinetka] in Bulgarian. For 2009 a vignette for one week costs 10 leva, for one month 25 leva, for one year 67 leva. This is what a vignette looks like. If you have decided to visit Bulgaria and if you are reading this post it means that you are a traveler as opposed to a tourist. A tourist will see most of the above as imperfections, while a traveler will find them charming and unique. Bear the above tips in mind, stay open and you will have a great experience in Bulgaria. This post is part of the Blogsherpa Travel Carnival thanks to Todd and his blog Travel Safely. Feel free to leave comments or suggest more tips. If you have questions and you wish to contact me, you can use the contact form or just write to me at truebulgaria@gmail.com.